Posted April 1, 2016 by Clare Counihan & filed under News. Why should you know about her? 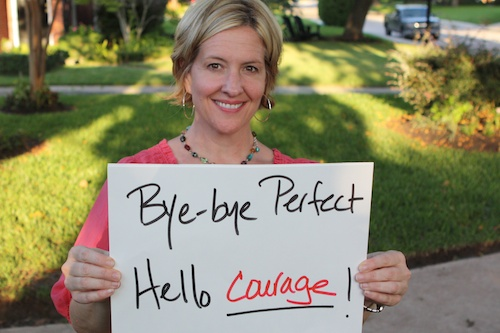 Brené Brown is an academic who gained popularity through her research about vulnerability, courage, and shame. She explores these topics by interviewing individuals and facilitating focus groups about making connections based on our sense of empathy, belonging, and loving. She shares her research by appearing on TED talks and being a guest on different television shows to discuss her personal journey to understand herself and human life. This research has changed her perception of her work life, love life, and parental life. Contrary to Brown’s research expectations, Brown’s six years of research lead to a simple conclusion: individuals who have a strong sense of worth believe they are worthy of love and belonging, which influences their parenting style. Having a sense of their own worthiness, parents take a step back from trying to control their children’s lives to avoid failure. In mainstream society, parents’ goal is to raise the perfect child in order for that child to have a successful life. In order to be successful, mainstream society dictates that the perfect child needs to be in a sport by five years old, be part of five different extracurricular activities in middle school, and accepted into an ivy league before they graduate high school. Brown cautions against this ideology and states that the responsibilities of parents are to accept that their children are imperfect but to show them they are worthy of love and belonging. Brief Biography: Brown studied social work all of her adult life. She received her bachelor’s in 1995, her master’s in 1996, and her Ph.D. in 2002. She started her career as a research professor at the University of Houston School of Social Work. She presented her research at Ted Talks with her first talk focusing on vulnerability and presented at another TED Talk discussing shame. The defining moment that led her to the TED Talk stage was in Minneapolis in 2007, when she was speaking to a crowd of 500 women about shame. Brown had a panic attack, closed her laptop, and started talking about shame. She embraced the method of oral storytelling rather than formally presenting her research. Additionally, she has never turned down a chance to present her work for 12 years. Brown has published many articles and books, including the best seller Daring Greatly: How the Courage to Be Vulnerable Transforms the Way We Live, Love, and Parent. In 2013, she appeared on Oprah’s “Super Soul Sunday” to discuss the book about the 10 qualities wholehearted people have in common. Brown is currently the CEO for the Daring Way, a certificate program for professionals to become facilitators of conversations on topics such as vulnerability, courage, and worthiness. The Daring Way curriculum is designed to help individuals identify new decisions and practices that will help them to become a wholehearted person. The goal of the certificate program is to build resiliency skills and create daily habits that transforms the ways a person lives, loves, and parent. Brown’s parenting style has definitely changed due to her research. In today’s society, there are books that teach individuals how to parent their children and answer questions that are unanswerable by their loved ones. According to these manuals, if you stick to certain rules and/or methods, then you can become a parenting expert, and your children will be perfect. They will be able to sleep through the night, make friends, have high self-esteem, and be safe. Uncertainty can be a parent’s worst nightmare, and these parental handbooks can be a way for parents to ease that fear. Shame is produced when uncertainty about their parenting lingers in their minds. These books can help take away that shame by getting rid of uncertainty. These books promise to create parenting experts, masters of the one true childrearing practice. Then, these rules and methods in the book become the only way to raise children through sheer popularity. Brown challenges this notion by embracing being an imperfect parent. Toni Morrison was her inspiration for challenging this. Morrison brought awareness to the daily habit of parents. When a child walks into a room, a parent is more likely to criticize them such as “pull your hair back” or “tie your shoes.” Morrison changed her daily habits by making sure her children see her “I’m happy to see you” face rather than the critical face in response to her children changing their appearance. In 2012, Brown created the Wholehearted Parenting Manifesto. Brown wrote the parenting manifesto to stop her from comparing her children to other children and to stop measuring their ability to be successful based on their accomplishments. Brown uses the manifesto as a way to be vulnerable and to show that who you are and how you interact with the world are stronger predictors of children’s well-being than “knowing” how to parent.